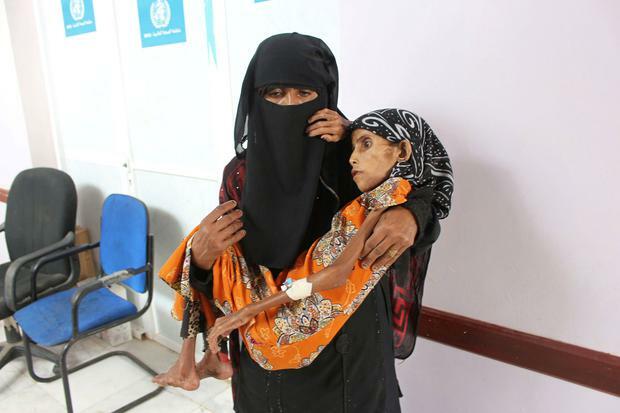 "All the fat reserves in her body have been used up, she is left with bones," Makiah al-Aslami, a doctor and head of the clinic in north-west Yemen. "She has the most extreme form of malnutrition." Fatima's slide into starvation is typical of what is happening in much of Yemen, where war and economic collapse have driven around 10 million people to the brink of famine, according to the UN. Dr Aslami said she is treating more than 40 pregnant women with severe malnutrition. Since the end of 2018, 14 deaths from malnutrition have occurred at her clinic alone. Fatima, her 10 siblings and father were driven away from their home near the border with Saudi Arabia and forced to live under a tree, said her older sister, also called Fatima. She said they were fleeing bombardment from the Saudi-led coalition, which intervened in Yemen in 2015 to restore the internationally recognised government of President Abd-Rabbu Mansour Hadi.